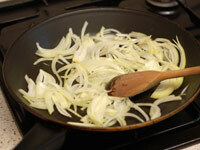 Finely slice the onion and fry for 3 minutes in a little olive oil. 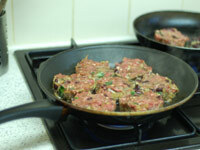 The aim is to very slightly soften it but not to cook it too much. Put the onion in the bottom of a mixing bowl and allow it to cool for a few minutes. 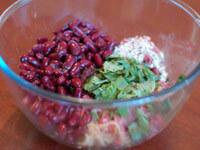 Add all the other ingredients to the mixing bowl apart from the egg, tearing up the basil leaves as you add them. Mix the ingredients together with you hands then add the egg and kneed it into the mixture. Use a pastry cutter to shape the burgers. Simply take a small handful of the mixture and push it into the cutter on a flat surface. 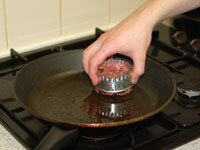 Transfer each burger to a non-stick frying pan spayed with olive oil and cook on a low heat. 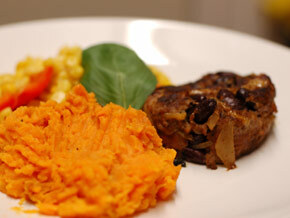 Cook for 7 minutes on each side then serve with mashed sweet potatoes and a vegetable side.